Solar photovoltaic is a second development segment at EDF Renewables. The company operates in France and in North America and has recently established a foothold in several growth markets in South America, Asia and the Middle East. Solar energy is a reliable, low-carbon and increasingly competitive solution. The segment is developing rapidly as a result of improved technologies and lower generating costs. 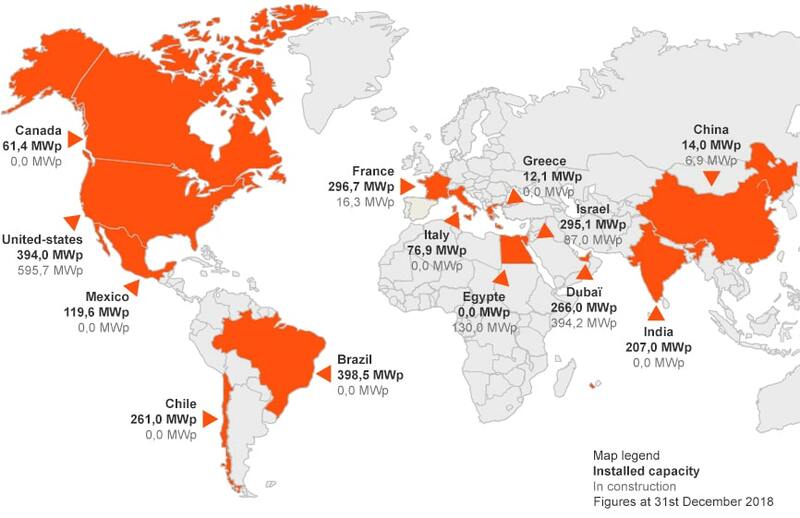 Worldwide capacity increased by a factor of 66 between 2004 (3.7 GW) and 2015 (247 GW), with about 70 GWp of new capacity built in 2016; at the same time, the price of photovoltaic modules was reduced by 90% over a 10-year period. EDF Renewables capitalizes on several years of experience gleaned from developing and building projects in France and in other countries. The Group develops suitable technical solutions to optimize production, including energy storage and solar trackers. The largest solar power plant ever built by EDF Renewables is located in the Atacama Desert and comprises 500 hectares of solar panels, including solar trackers. EDF Renewables also delivered the 50 MWp Zmorot solar plant in Israel, which is designed with a grid coupling of four photovoltaic assemblies in a desert zone. The Group commissioned one of the world’s first solar power plants with energy storage. EDF Renewables acquired groSolar, the company which designs, develops, builds and markets comprehensive photovoltaic solar solutions for local authorities, businesses and industry. In parallel, the US subsidiary launched a business focused on the development of Distributed Electricity and Storage solutions involving batteries and smart energy management. It is working in close cooperation with the EDF Store & Forecast company, which designs smart software tools. The company’s EDF ENR subsidiary offers rooftop solar solutions for homeowners and businesses and recently unveiled the market’s first self-consumption solution with storage. The new range enables consumers to generate their own electricity using solar panels and to store some of it for later use as needed. It gives customers a range of simple tools that help them maximize their self-consumption rate and installations are sized according to actual customer requirements. The customer can track consumption online via a tablet or smartphone to control energy spending and use the battery to store surplus electricity produced. Photowatt, a subsidiary of EDF Renewables, has pioneered the solar industry for more than 35 years. The company designs and produces crystalline silicon photovoltaic panels in France, which are used in various applications ranging from residential installations to solar plants.